Knowledge is the connections we make between concepts. To explain knowledge, I am saying the lines we draw on mind map actually represent our knowledge, not the words we write on the paper. To actually know something means you can apply it in different ways, or express its shape with different forms. Competence and Propositional Knowledge fits within my own boundaries of what I think this word “knowledge” really entails. Conclusion: therefore knowledge is the connections we make between concepts. In my syllogistic argument, I begin with defining what a concept is. Starting here I am able to delve deeper into my thoughts because I am clearly laying them out. A concept is constructed by our brains as a means to interpret the world around us using the characteristics of the concept. These characteristics are identification towards the concept. An example of a concept widely excepted by our race is the concept of love. This is an intangible thing, and we are unable to fully describe it with our words, yet we agree that it exists. It is commonly referred to as a feeling, and one will know they are in love when they get the excited feeling in their stomach and protective nature towards this other person. Another concept we encounter daily is the significance of education and its founding effect in society. Uneducated people are seen as useless members of society, people who are not able to contribute anything of great importance regarding development and renovations. Similarly, educated people are given jobs that pay more money because we value knowledge. Which brings me back to my question of when do we know we know something? My second premise states that a connection between concepts relies on the comparisons you can make between them. For example, between love and the significance of education I can make the connections that they are both woven into the average lifestyle and somewhat forced upon us by our environment. We as humans aspire to encounter and feel love, but why is it so strong? Partly a psychological matter, but also the response of the media, selling us frivolous stories of romance and love. Education is a necessary step towards being able to work in a higher position that McDonalds drive thru attendant. Money is used as an incentive, also reported by the media to be the foundation of happiness. Therefore I can say I know the concepts of love and the significant of education because I am able to find relationships between the building blocks of each. In a normal day, we will make thousands of connections showcasing our knowledge. An example is seeing the rain outside and then recalling a memory of the unpleasant feeling of being soaked to the bone, therefore knowing in order to stay comfortable we must carry an umbrella. Had I see the rain and not recalled a memory, I would not know that I must carry the umbrella because I was not given a relationship between concepts to form my learnin g.
David Hume also had some thoughts about the important of connections in the Stanford Encyclopedia of Philosophy. His ideas highlight that there is a necessity towards connections and the mental process of forming relationships is crucial to our understanding of the world. He splits it up into Critical and Constructive Phases of the Necessary Connection, but basically its existence of debate gives meaning to its stature. He discusses a relationship between cause and effect. The debate on if its a necessary connection and holds true meaning, or whether we perceive it to make sense of our world. Other natural connections we are able to make are discovering the types of people we find most comfort in or a reason as to why we learn a lesson from certain instances. Drawing our connections from two different sources allows us to expand our mind and lessen the compartmentalization of ideas that often takes place in the school or work place. In conclusion, knowledge is shown by our ability to draw connections between concepts by determining like characteristics. When creating a theory of what knowledge is I came to understand that it is fueled through experience. Whether that experience is physical (one is creating an understanding that fire is hot by touching it) or mental (one is creating an understanding that fire is hot by reading about it). There are so many different ways in which people can begin to understand and gain knowledge of different topics, just as there are many ways in which they encode that knowledge. 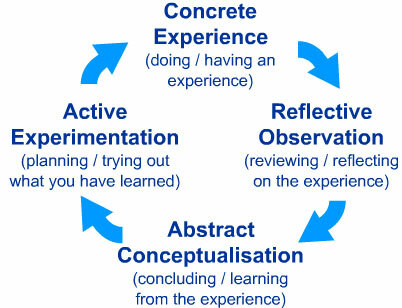 Klob’s theory of the experiential learning cycle outlines that there are four steps in the cycle of learning through experience: Concrete Experience, Reflective Observation, Abstract Conceptualization, and Active Experimentation. Concrete Experience involves encountering a new situation or the reinterpretation of an existing experience. Reflective Observation involves reflecting on the experience being sure there are no inconsistencies on the experience and the understanding of it. Abstract Conceptualization involves the discovery of new ideas or the abstract understanding that come to mind through reflections. Active Experimentation involves the learner applying new knowledge to real life in order to see what may result. 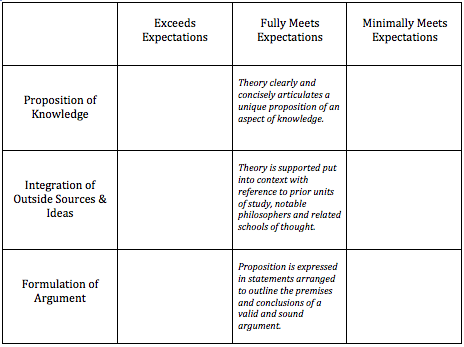 In Klob’s theory, all parts of the cycle are necessary for a person to fully gain knowledge. No one category can be effective on its own. Knowledge can be perceived differently person to person. Many people have different learning styles which affect how they learn and what they gain from their experiences. Klob’s theory also involves the different styles of learning that people may have. Different variables affect a person’s learning style, and how they perceive their experiences. For example, social environment, educational experiences, or the basic cognitive structure of the individual all play a role in how that person learns. 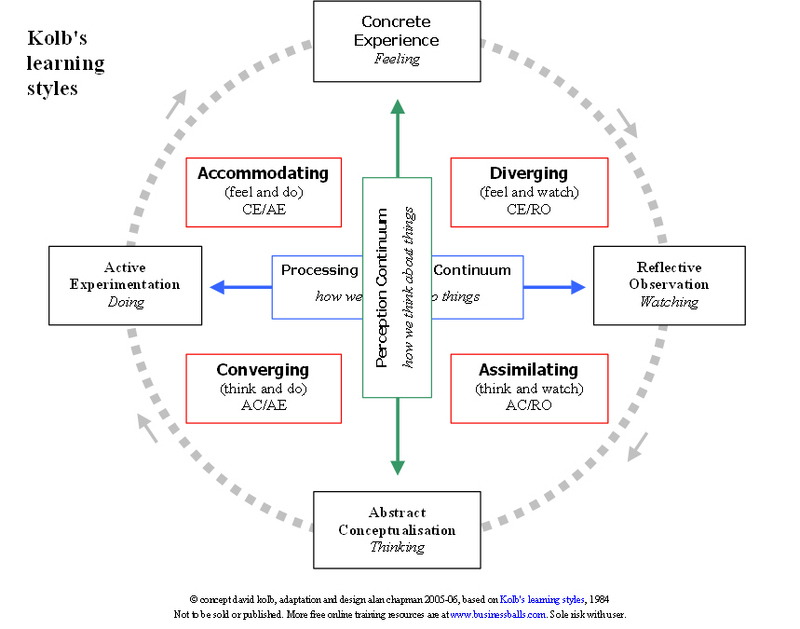 Klob’s theory involves four different learning styles: Diverging, Assimilating, Converging, and Accommodating. 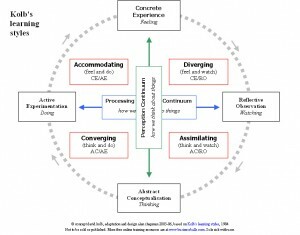 Diverging (feeling and watching – CE/RO): People who use the learning style of diverging knowledge are often able to look at things from different perspectives. These people are sensitive to their surroundings, themselves and others. These learners prefer to watch rather than do, tending to gather information and using their imagination to solve problems. Diverging learners are best at viewing concrete situations at several different viewpoints and perform better in situations that require idea generation e.g. brainstorming. Diverging learners are generally more social as they prefer to work in groups, to listen with an open mind and to receive personal feedback. Assimilating (watching and thinking – AC/RO):People who use the learning style of Assimilating knowledge use a logical approach when solving problems or interpreting information. These people value ideas and concepts over information from other people. They require a good clear explanation of a concept rather than a practical opportunity to physically use their knowledge.Assimilating learners excel at understanding a wide range information and organizing that information in clear logical formats. These people are more attracted to logically sound theories than approaches based on practical value. They prefer readings, lectures, exploring analytical models, and having time to think things through when attempting to gain new knowledge and understanding. Converging (doing and thinking – AC/AE): People who use the learning style of converging knowledge can solve problems and will use their knowledge to find solutions to practical issues.They prefer technical tasks, and are less concerned with people and interpersonal aspects of thinking.These learners are best at finding practical uses for ideas and theories. They can solve problems and make decisions by finding solutions to questions and problems which enables them to specialize in technological tasks. Accommodating (doing and feeling – CE/AE): People who use the learning style of accommodating knowledge tend to be ‘hands-on’ learners, and rely on their intuition rather than logic. They use other people’s analysis, and prefer to take a practical, experiential approach when solving problems. These learners are often attracted to new challenges and experiences, and to carrying out plans. They act on ‘gut’ instinct rather than logical analysis and are the most prevalent learners in the general population. The east-west axis of the cycle is called the Processing Continuum. This is how we choose to approach a task. 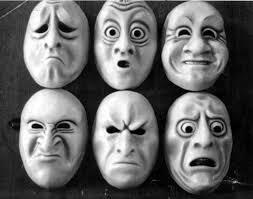 The north-south axis is called the Perception Continuum which is our emotional response to our experience. Stutton concludes that knowledge is subjective; a point that I whole heartily agree with. Knowledge is biased as no one person will experience, perceive and express their knowledge exactly the same way as another. Thus my theory of knowledge is that knowledge is fueled by experience, influenced by perception and expressed in a subjective manner. If you gain knowledge through experience, and knowledge is the information you retain then knowledge is the amassed information. In my view, knowledge is what you learn from everything around you. All the experiences you go through, help aid you to be a more knowledgeable person. For example in the Crocodile Dundee movies, Mic is very knowledgeable about living and surviving in the Australian outback, because that is where he grew up. 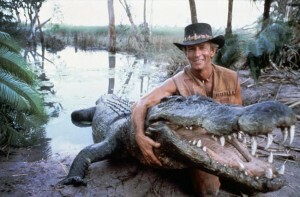 Most of his life experiences have to with learning the ways of the outback.While Sue ha vast knowledge about city life and almost nothing about being in the outdoors. Through the movie they both experience a taste of a different world and it makes them both have a greater knowledge from their experiences. I think subconsciously we choose the information we keep, and our knowledge is the retained information. We chose the information we think well need down the road. Say you live in the mountains of Montana, your going to want to know how to survive. So your subconscious will choose the information it needs. If someone told you how to make a excel document, you’ll probably forget how to do it after a little while, because you know you wont need this information. What we consider knowledge is all the information we’ve accumulated over time, the information that we thought was worth holding onto. Proposition: Knowledge cannot be effectively shared only through spoken language. As humans, we are constantly sharing and gaining knowledge through communicating with others. The question is if the knowledge we are communicating is the same knowledge gained by another. Is communication ever fully effective? By definition, effectiveness is decided by successfully producing a desired or intended result. I would argue that no type of communication is ever fully interpreted correctly. Can we fully communicate without a universal language? A main form of communication is through spoken word. Languages vary all over the world, with roughly 6500 spoken in the world today. Mandarin Chinese is the most popular language in the world, spoken by about 1.21 billion people. This is one of the main flaws in communication. There is not one universal language that all humans use to speak with one another. Translations between languages are never 100% accurate, already altering the meaning of the shared knowledge. Again as humans, we are all unique individuals with different experiences, personalitities, opinions, and values. Anything that we observe, hear, or feel is different when compared to another human. Therefore, when interpreting knowledge, it will not be exactly the same as the knowledge outputted to us. 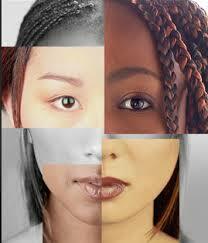 Some may argue that there is a universal language between humans, but not through spoken word. What emotions do these facial expressions portray? All humans smile, laugh, and cry, despite where they live in the world. Our facial expressions, tone of voice, and body language definitely aid in communication, but cannot be solely relied on for sharing knowledge. This can also be interpreted incorrectly, and some people cannot comprehend this universal language. Some humans suffer from social-emotional agnosia, which is the inability to interpret facial expressions, body language and voice intonation. This disorder usually effects people with autisim or schizophrenia, and limits social interaction. For credit as well as open-online participants are invited to respond to the following prompts in developing a personal theory of knowledge to be share on the blog by the end of next week (Friday December 5th). 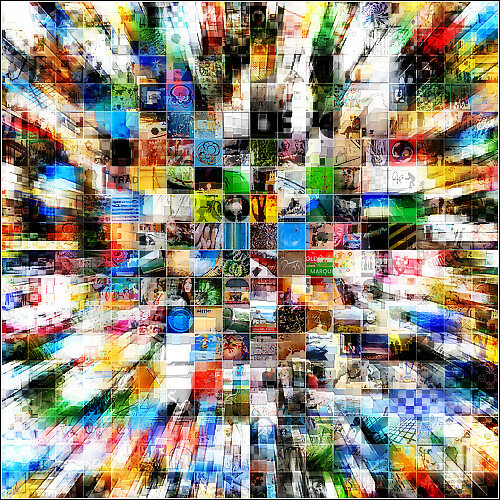 It’s a Blog Post: Each personal theory of epistemology will be posted in the form of a blog entry on the class site. Tell us what you know: Identify a specific aspect or perspective of your view of knowledge ( how, where, and under what conditions it exists, is acquired, communicated). Be Logical: Represent the statements formulating your proposition of knowledge as a syllogism or logical argument. Cite your Sources: Whether the website that originally posted the image at the top of your post or the thinker(s) who informed your own ideas, use links and identify how others’ have influenced your published work.